But tiny houses are a hard sell if for no other reason than cramped quarters are, well, cramped. Unless you have an aversion to stuff, hate shopping and actually like sleeping, eating and entertaining in the same room, most of us move up the real estate ladder as soon as the last student loan payments are made. After all, there’s nothing fun about rolling out of bed and stepping in a pile of whatever couldn’t fit into the single, overflowing storage cupboard. Or at least that was the case until Canada’s overheated real estate market started pricing out all but the most well-established, well-financed individuals. So designers and developers have been looking at ways to create small-house solutions that are both affordable and livable. Already diminutive condos are getting compressed to the size of storage lockers, designer cottages are being shrunk to the proportion of trailer homes and backyard guest bunkies are being built little bigger than garden sheds. But even though the square footage is minimal, the spaces are as light-filled and capacious-feeling as abodes that are two or three times bigger. Super-small has been a trend in condo living for years. Yet even there things are getting more minuscule. Smart House recently announced a proposal for a 25-storey, 241-unit building in downtown Toronto. Designed by architectsAlliance with an expected completion date of 2017, the units start at 300 square feet for $249,000, and will incorporate clever features that add versatility: sliding partitions that allow spaces to expand and contract, couches and desks that flip down from the walls and kitchen counters that pull in and out. Freehold homes are also getting micro-sized. Graham Smith, a Toronto-based architect and co-founder of the design firm Altius, has created a line of prefabricated, compact dwellings called miniHomes that are available to purchase, essentially off the rack, across North America. They take about six weeks to manufacture, with an additional two to three weeks of on-site instalment. Smith sees “a major shift in building over the next couple of decades,” specifically because of two key demographics: namely those 18 to 35 looking to purchase their first home, but who are priced out of the traditional housing market (a miniHome might cost $100,000, with a few hundred dollars more per month to heat, cool and keep the lights on), and retiring boomers who want a simple cottage or second home that costs less than their kids’ university educations. Smith’s designs are elegant, efficient and extremely compact. The Duo 36, for example, is a mere 576 square feet, but has a master bedroom, full kitchen, dining area and living room. The interiors are finished in warm, woodsy materials – cork, Baltic birch, pine – that are light-coloured as to not be oppressive. Guests can sleep on a 96-square-foot loft platform; a 288-square-foot attached deck adds 50 per cent more living space outdoors. Nathan Buhler, a designer and co-founder of the Toronto-based studio BLDG Workshop, sees a growing market not just for itsy-bitsy piles, but for itsy-bitsy guest quarters as well. Three years ago, while collaborating on a little cottage-side guest bunkie with interior designer and HGTV star Sarah Richardson, it occurred to him that small, backyard sleepers would be an inventive way to accommodate extra guests without an expensive, invasive reno or a costly upgrade to a grander manse. Partnering with fellow designers Evan Bare, who specializes in small-space furniture, and Jorge Torres, as well as businessman Jim Moore, Buhler created the Bunkie. The DIY assembly comes flatpacked like an IKEA kitchen, and takes four or five skilled workers just under a week to put together. The first prototype was officially unveiled last week at the IIDEX interior design and architecture show in downtown Toronto. None have sold yet (the price ranges from $29,900 to $46,900), but Buhler has had interest from around the world, including buyers in Finland and Japan. From the outside, the Bunkie has the simple but cheerful shape of an iPhone app. It echoes the traditional form of a peaked-roof house with a proud chimney stack, but is rendered in a contemporary mix of sleek aluminum, wall-to-wall windows and rustic, reclaimed barnboards. Inside, the floor area is a tightly packed, 100 or so square feet. It’s so small that the Ontario Building Code doesn’t even consider it a proper building, putting it in the same classification category as a garden shed or a backyard barbecue. But it’s designed with the multifunctionality of a Swiss army knife to make for a surprisingly gracious suite. A queen-sized Murphy bed is tucked discreetly into a polished, Forest Stewardship Council-certified plywood wall. When pulled out at night, it takes up much of the floor area, but when it’s away, it allows for a comfortable sitting area next to an ethanol fireplace. Built-in bookcases provide storage or display shelves for art, and the expansive windows and 11-foot, cathedral ceiling create an airy atmosphere. Buhler concedes that privacy might be an issue for some perspective buyers, noting the lack of curtains over the glazing. But he also points out that architecture has a long history of transparent buildings – such as Ludwig Mies van der Rohe’s Farnsworth House and Philip Johnson’s Glass House – that simply rely on surrounding, lush vegetation to prevent an unexpected peep show (“and a curtain rod can easily be added,” Buhler notes, for those who live in urban, tree-free areas). The bigger issue might be that the small footprint doesn’t allow for a tap, toilet or place to put kitchen utensils. But even if guests aren’t keen on glamping in the backyard without plumbing or a place to make a morning coffee, homeowners might want to keep the Bunkie all to themselves, as a second living room or a garden-side pavilion to read quietly and forget about the world. This piece originally appeared in the Globe and Mail on Thursday, October 3, 2013. 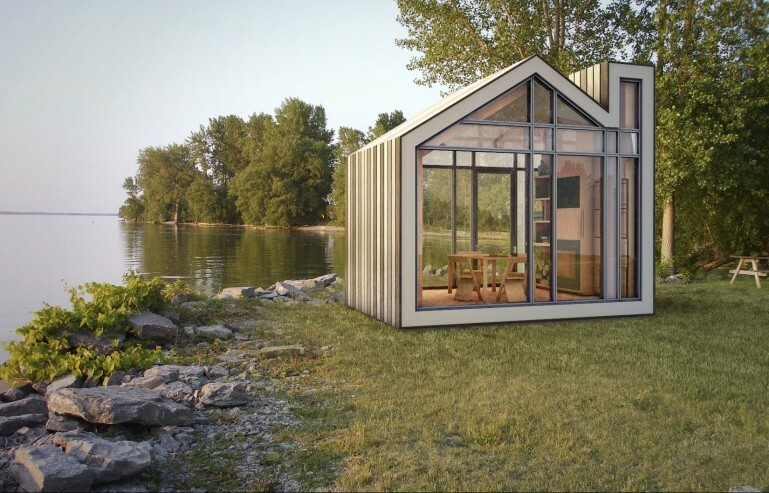 This entry was posted in Shelter Skelter and tagged Architecture, Bunkie, Canada, Design, Globe and Mail, Small Apartments, Tiny Houses, Toronto by mmhague. Bookmark the permalink.